Never before has a full body workout been this easy. 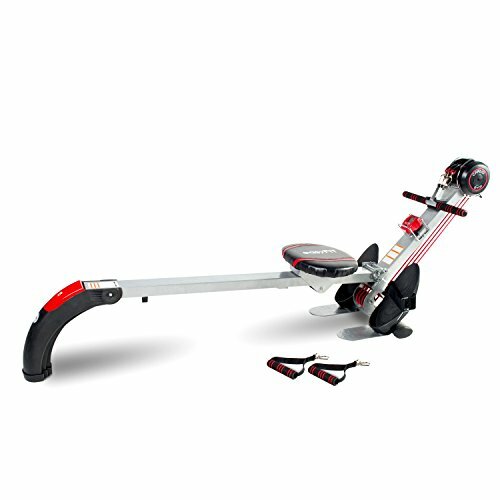 The easyFiT Cardio Gym takes the essential elements of exercising (cardio and strength) and combines them into one affordable piece of equipment. CARDIO Rowing is widely regarded as one of the best all around activities for cardiovascular fitness This low-impact motion minimizes joint stress, reducing injury risks while also exercising all major muscle groups including the back, legs, arms, abdominals and buttocks. Rowing is also one of the best exercises for building a strong back and core, as well as, an effective aerobic exercise for increasing your metabolism for more efficient calorie and fat burning. The Cardio Gym is constructed with a steel frame and padded gliding seat both are designed to withstand years of use while giving you a stable and comfortable workout. Folding feature allows the Cardio Gym to be stored while not in use. While a built in monitor helps to keep track of progress including time, stroke and calories burned. Also included are 1 x straight rowing/exercise bar and 2 x individual hand straps to which are ideal in isolating muscles during workouts. STRENGTH The Cardio Gym also doubles as a space saving strength training system. The resistance tubing that is used to increase or decrease the level of resistance for the rowing motion also can be utilized in strength training. Challenge yourself with 3 tension levels and to perform dozens of exercises while building muscle and burning fat as effectively as free-weights. While there are material differences between using free weight and resistance tubing for exercising, both are effective. Studies have shown that programs using resistance tubing and similar devices increase muscle strength and muscle size while decreasing body fat in a similar manner to free-weight training programs. Both methods utilize 4 critical properties: a) resistance, b) range of motion, c) variable speed of movement, and d) both allow progressive resistance. If you have any questions about this product by Easy Fit, contact us by completing and submitting the form below. If you are looking for a specif part number, please include it with your message.